Innovative projects across the US are demonstrating the power of housing to go well beyond providing places for people to live. While debates continue about it as a fundamental right and the government’s responsibility in ensuring its citizens adequate shelter, it’s clear that thoughtfully planned housing can improve health, education, and environmental outcomes. Well-designed, affordable housing supports the dignity, well-being, and sense of place of its residents. Moreover, as Karen Kubey writes in the introduction to her new publication Housing as Intervention: Architecture towards Social Equity, “Housing projects, and the design processes behind them, can be interventions towards greater social equity, defined here broadly as fair access to opportunities and resources for an economically stable, healthy life.” And architects, planners, and developers can be the agents for change. Housing projects that have won the Rudy Bruner Award showcase the key ingredients for urban excellence: leadership and vision, collaborative partnerships, engagement and empowerment, anchoring in place, and leveraging design. What continues to hold our attention is their ability to address inequities by meeting other community needs, often in graceful and beautiful ways. 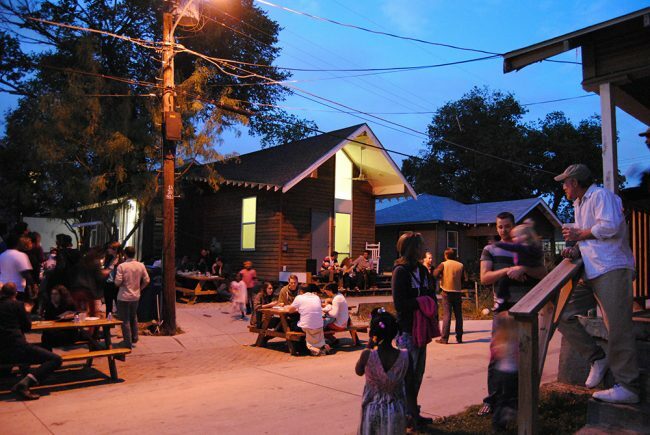 The modest 1920s houses on Congo Street in Dallas, Texas, had been targeted for demolition when the nonprofit design studio buildingcommunityWORKSHOP came up with a collaborative, community-based approach that engaged homeowners in every phase of their design and reconstruction. While an important goal was maintaining the tightknit neighborhood and stabilizing home ownership for families that had lived there for generations, the plan delivered much more. Residents avoided displacement during construction with the aid of a Holding House on donated property. Solar and thermal systems delivered energy efficiency that earned LEED Gold and Silver certification. The initiative spurred the city to rebuild Congo Street with permeable pavement and measures for storm water management to create Dallas’ first “green street.” The project has sparked new investment in the surrounding neighborhoods, along with a Phase 2 project that seeks to maintain the unique sense of place, interaction, and rootedness embraced by the homeowners. 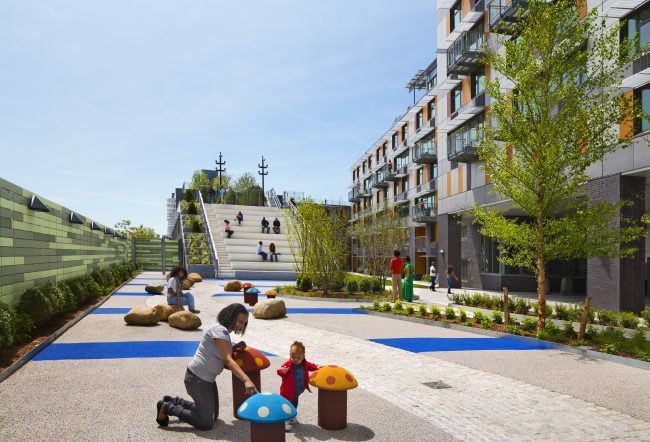 Via Verde in the South Bronx of New York City grew out of two international design competitions sponsored by AIA New York, which aimed at creating a new standard for affordable, green housing, demonstrating that innovative design can be sustainable and replicable. The neighborhood stated its priority–a healthy place to live–and the winning architectural team responded with a progression of open spaces on multiple levels that invite outdoor activity. To meet the community’s health goals, the complex also includes a medical center and pharmacy. Site remediation and energy-efficient design earned LEED Gold certification and should reduce future operating expenses in the complex. Plus, the project’s beauty has had far-reaching impact. Following its success, the NYC Department of Housing Preservation and Development began to give greater emphasis to design in project selection and saw the quality of proposals rise. In creating a unique place of refuge in the South Bronx, the team affirmed the dignity–and health–of the neighborhood and the people who live there. Motivated by low teacher retention in the Baltimore, Maryland, schools, Millers Court was designed to combat the isolation and discouragement that caused many teachers to leave the district. In a historic manufacturing building that was once the fulcrum of its neighborhood, the project has achieved a culture of safety and support for the educators who live there and for educational nonprofit tenants. 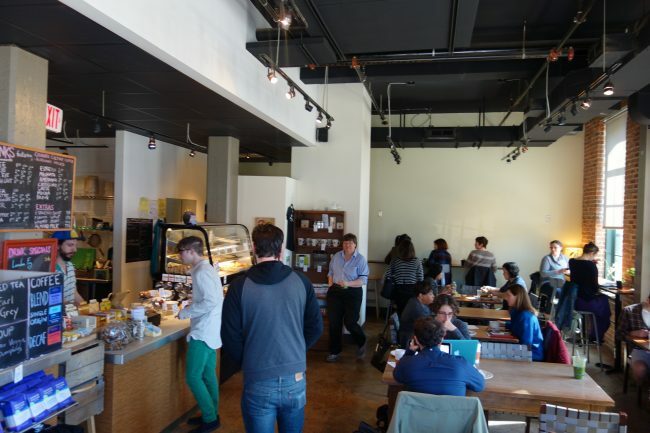 Here too, prospective residents helped to determine the plan, and the LEED Gold building includes a library, a workroom with a high volume copier, a café, and plenty of other indoor and outdoor spaces to encourage an atmosphere of interaction and sustenance. Activities sponsored by the management company catalyze collaboration among the educational nonprofits, as well as between nonprofits and teachers, who report that living at Miller’s Court has increased their commitment to teaching. At the behest of tenants who wanted to remain in the neighborhood, the developers agreed to buy and renovate several private homes for sale, and they have replicated the educators’ housing model in other Baltimore communities. Today, the benefits of affordable housing have the ability to extend far beyond a roof overhead. These RBA winners, along with Project Row Houses, Quixote Village, The Bridge Homeless Assistance Center, and others, question the value assumption that we can’t afford design for affordable or low-income residences. They engage inhabitants and the surrounding community with respect and a broad sense of inquiry, embrace the existing sense of place, and reverberate well beyond their mission of providing shelter. Stay tuned for our next post on infrastructure.